“As you all know from my past articles, I have a problem making friends due to my Asperger’s. It was recommended by my pediatrician to consider getting me a companion dog. After speaking with my doctor, my parents approached me with the idea. My first reaction was “are you crazy, I’m afraid of dogs!” You see, when I was young I had been bit by a dog and had some bad experiences with others. So the thought of getting a dog scared me to death. I thought “why would I want a dog, it’s only going to bite me. I don’t need this anxiety in my own home”. But I was wrong. My parents and I went to the National Service Dogs here in Cambridge, Ontario. The National Service Dog matches service dogs and companion dogs with people with disabilities. What I found out is a lot of dogs are matched with kids with Autism and Asperger’s. She explained that all the dogs are trained and will not bite and for me not to worry. She explained that a dog is the best listener and gives unconditional love. She will be my friend forever and will never turn her back on me. First thing I thought was “sounds good, but things that sound too good are not real”. The lady brought us back to meet some dogs, and of course I hid behind my mom. She gave us treats to give to the dogs for my first contact with them. I eventually gave some to the dogs (dropping the cookie on the floor before they could reach my hand) and thought “well none of them bit me yet”. My mom discussed the details with the lady on how to apply for a dog, then we left. About two weeks later the lady from the National Service Dogs dropped over for a personal interview. She brought a service dog with her to see how I would react with the dog in the house. I went outside with her to play with the dog. I will admit it, it was fun. The lady explained that we would be placed on a waiting list and when they feel they have the perfect match for me she will notify us. Well that day came just before Christmas. They introduced us to our new dog Ellie. She is a black Labrador with a heart of gold. I have now had Ellie just over 3 months. I will admit, I still don’t like dogs, but I love mine. She greets me every day with kisses and yes she listens really well (she has not shared any of my secrets). I didn’t realize that a dog can change your life. My mom says my anxiety level is down and I seem a lot more happy. I take her for walks and she loves playing ball. The best part is when I come home from school after having a bad day, Ellie is there to make me smile again. 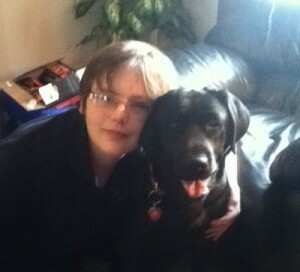 If I could, I would match all kids with Autism and Asperger’s with a dog. They make you feel special and loved. When I see her when I get home, she makes me forget about my day with her tail wagging and her big smile. The quote “A dog is the only thing on earth that loves you more than you love yourself” (from Josh Billings) is an exact metaphor for my feelings of Ellie because I know she will always love me even when I hate myself. On behalf of the National Service Dogs of Cambridge, we were asked as a family to help raise funds for the care and training of these exquisite dogs. National Service Dogs’ Companion Dogs are valued at $5,000; however, they are provided to families free of charge. P.S. Matt wanted me to make it clear that there is no minimum donation and if you could even offer just $1 it would be hugely appreciated. In addition to Matt’s thanks I have also just recorded an hour long interview with Matt and his mum Nansi. Where they reveal their own methods and strategies for coping with Asperger’s. So everyone who donates will get a copy of this interview in mp3 format for free. and I’ll send you the interview in about a weeks time, when I’ve edited it. I recently interviewed a really inspirational mom from Australia who has developed a pretty unique way of helping her son with Aspergers to develop; and the results speak for themselves. Her name is Anne Miles and she has been able to take her son (J) from the point of a very low ebb in his life (which included him having suicidal thoughts at the tender age of 7), to become the School Vice Captain. Anne studied various disciplines whilst raising J which include life coaching and Neuro Linguistic Programming (NLP). Now if you’ve never come across it, you may think that NLP seems a very complex and academic sounding term; and to be honest it does sound rather high brow! But what it really means is how people organise their thoughts, feelings, language and behavior to produce the results that they do in their life. So Anne took what she studied in NLP, along with what she had been doing naturally as a parent, to help J. One great example of this is by looking at inspirational people with Aspergers and dissecting their success. For example she mentioned people like Bill Gates and Einstein who are both rumored to have Aspergers. She then spent time studying and discussing their strengths with her son, and helping him to really see what advantages Aspergers can bring. Another idea on this theme is about turning her son’s obsessions into what Anne calls “mastery”. She gave me an example of a child with an obsession of tying shoe laces. Now to tell him not to do this is ineffective. But to allow him to continue to do this activity, which is not going to be seen in a very positive light socially, is unhelpful too. So Anne suggests channelling this energy into (for example) making a shoelace sculpture, which has a far more socially desirable outcome. Her own son J is now a very accomplished artist following such techniques. A third and final point that I would like to share today is the idea that we should never tell a child with Aspergers what NOT to do. Due to their very literal and often rigid thinking they are not able to work out on their own what in fact they SHOULD do. So rather than say “stop running straight across the road without looking” instead you should say “you need to cross the road at the crossing, look both ways at traffic and walk steadily but not too fast”. So the instruction is in a very explicit manner (no grey area, just plain black and white what to do). Anne has had a lot of success with using this type of approach with J. Well like I say this is just a snippet of what Anne had to tell me, and there will soon be opportunity for you to listen to the whole interview (including her fascinating approach to melt downs, which allowed J to go from almost daily meltdowns to only having 1 meltdown in the past 6 months)! I hope this information has been helpful today, and please give me and Anne any feedback on the blog comments section below. What are the most beneficial therapy types available for Aspergers? When a child is first diagnosed with Asperger’s Syndrome, he may be referred for therapy. Asperger’s Syndrome, as you know, is not a condition that can be cured. Asperger’s Syndrome is a neurodevelopmental condition that is treated with an individualized treatment plan that may include different therapies and medications. “The Autism Sourcebook : Everything You Need to Know About Diagnosis, Treatment, Coping, and Healing,” by Karen Siff Exkorn is one of the best published resources for families dealing with Autism and Asperger’s Syndrome. Written by a parent of a child with Autism, this book covers all aspects of living with Autism once the diagnosis is received. Here are some of the most common treatment options. * Young children are often treated with ABA therapy. Applied Behavioral Analysis is a form of therapy used to teach young children basic skills in many different areas. For example, ABA can be used to teach young children to make eye contact, to play with toys, and to identify shapes and colors. * Cognitive-behavioral therapy is used to treat the emotional side of Asperger’s Syndrome like anxiety, depression, and obsessions. This therapy helps form the connections between feelings, emotions, and behavior. * Occupational therapy is basically used to teach independence. Grasp, handwriting, social skills, and play skills are often included. This therapist may help your child learn to tie his shoes of zip his jacket. * Sensory integration therapy may be included by the occupational therapist. Some occupational therapists are trained in sensory therapies and some are not. This therapy helps get your child’s sensory systems in synch. * Speech/language therapy covers speech articulation as well as pragmatics, or fluency. Language therapy covers social communication, and in some cases, social skills. Speech/language therapy will help your child learn to communicate verbally or nonverbally, if necessary, with the use of picture exchange and/or sign language. * Physical therapy addresses the physical awkwardness that sometimes comes with Asperger’s Syndrome. Awkward gait and lack of balance are common complaints. This therapist may help your child learn to kick a ball, walk up and down stairs, and ride a bicycle. * Social skills training is a therapy that teaches children with Asperger’s how to relate to others, making and keeping friends, how to recognize social cues and gestures, and other details such as personal space and understanding slang. 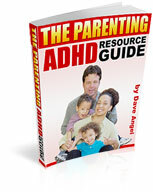 It is very important for parents to fully support and participate in their child’s therapy. Asperger’s therapies can be successfully performed by parents in the home with the proper support and training.